Everyone loves a good burger. These are the best veggie burgers we have ever had! You can make it mild or with a little spicy kick using chipotle and chili powders. Fixings: Chipotle Sauce, Soy/Almond/Other Cheese (Field Roast Chao is pictured), Caramelized Onions, Sautéed Mushrooms, Sliced Tomatoes, Sliced Red Onions. In a food processor pulse together garbanzo bean flour, garlic powder, onion powder, chipotle and chili powders (if using), mushroom powder, flax seeds and nutritional yeast. Add in hot water, apricot butter (or jam) and soy sauce or tamari. Process to make a smooth batter. In a medium-size bowl mix together the millet, rices, turanicum and walnuts. Add this mixture to processor. Pulse about 6-8 times to incorporate, scrape down the sides of the bowl and then process for about 5-10 seconds. Scoop out 1/3 cup and with oiled hands and form into a patty. The burger mixture is sticky and lightly oiling the hands makes it easier to handle. Place patty on a baking sheet. Repeat with remainder of the mixture, making 8 burgers. Bake in oven for 15 minutes. Remove and flip burgers to cook the on the other side. Bake another 15 minutes. Burger may be eaten immediately, refrigerated or frozen for later use. Burgers may also be reheated on a barbecue grill. Did you make your own porcini mushroom powder? No, I buy it from http://www.fungusamongus.com/ and I use it in a lot of dishes. It adds great flavor. 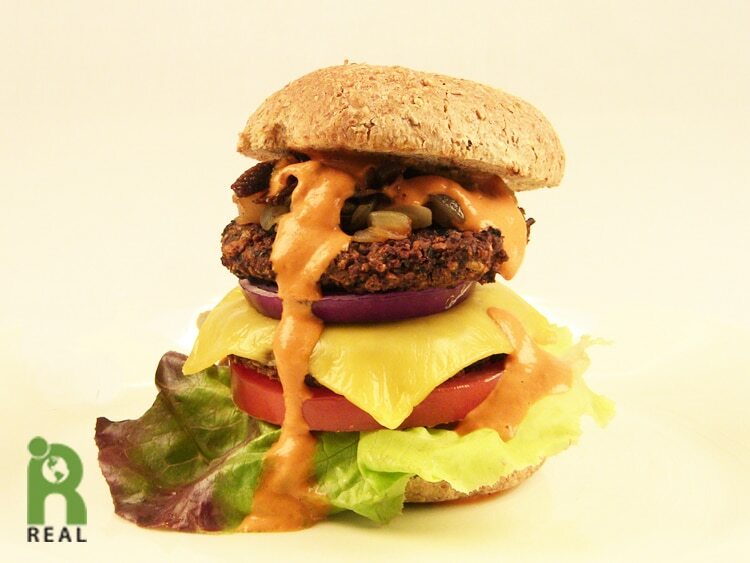 I was so excited today when the postman delivered my porcini mushroom powder so I could make these wonderful burgers. I took them to a lake party this evening and several carnivores tried one. They gave them a hearty thumbs up, as do I! Thank you, Caryn, for making veganism approachable and delicious! You made my day. Gary De Mattei gets all the credit for creating this recipe. So glad you made them and the carnivores liked them! Sounds delicious, but what a lot of pre-cooking required with 4 different grains! Not practical, I’m afraid. That depends. We often cook a lot of grains and beans that we use throughout the week. We like to have cooked Millet, cooked turanicum (kamut) and cooked red and black rices ready to go for our daily meal prep. If I know I want to make these burgers, I’ll prepare the grains a head of time. I prefer to cook the grains separately for the best color and texture for the burger, but you can cook them together all at once. And for holidays and special occasion, I think it is worth the extra effort.